Navigation apps like TomTom, Navigon Mobile Navigator, provide advanced features for intuitive turn by turn navigation and directions. These apps on the iPhone have been steadily replacing the usage of dedicated in-dash GPS devices, as they are more cost effective, easier to update and ofcourse, integrate with Localscope! While most turn by turn navigation apps provide precise maps and directions, capabilities for searching for or discovering places range from being limited to nonexistent in these apps. Localscope, on the other hand, provides unmatched search and discovery capabilities; with a few swipes and flicks, you can tap into the collective knowledge from various search engines and social networks. Combining the power of Localscope with the accuracy of turn by turn navigation apps makes your iPhone a much more powerful and relevant GPS device than any dedicated GPS device in the market today. 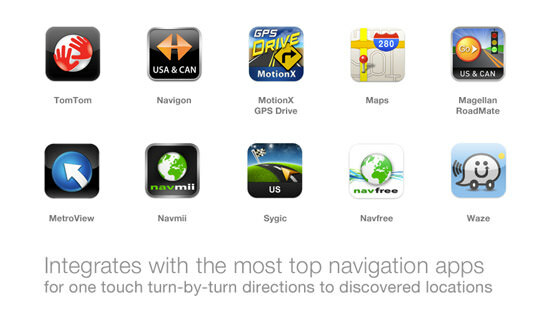 Integrating with navigation apps has been one of the most asked for feature requests by our users. Further, since Localscope is a global app, we have received large number of requests for integrations with regional navigation apps, from users worldwide. With this latest release, we are adding integrations with 4 more navigation apps - Magellan Roadmate, Navmii / Navfree, Sygic Navigation and MotionX GPS Drive HD (for the iPad) - totaling to support 11 navigation apps. Other integrations include: the built-in Maps app, Navigon Mobile Navigator, TomTom, MotionX GPS Drive, MetroView for Australia and NewZealand and Waze Social GPS app. Localscope integrates with all the regional versions of the integrated apps. No matter which part of the world you live in, you can use Localscope in combination with any of the 11 navigation apps specific to your region. Localscope automatically detects the supported navigation apps installed on your iPhone or iOS device and presents a list to choose from. With a single tap, you can jump right into one of your favorite apps from within Localscope to get turn by turn directions to your discovered place of interest. The new and updated version of Localscope is now globally available on the Apple AppStore, for US$1.99 (or the equivalent in other currencies).